How did a military base in a foreign country 7000 miles away from our previous home in Texas seem to my mother like a good, safe place to raise a child …? Why were there so many other American families, living in such well-developed suburban infrastructure, on Okinawa 50 years after U.S. soldiers first arrived there during the Pacific War? Who paid, and who is still paying, for my sense of safety there, and in what currency? 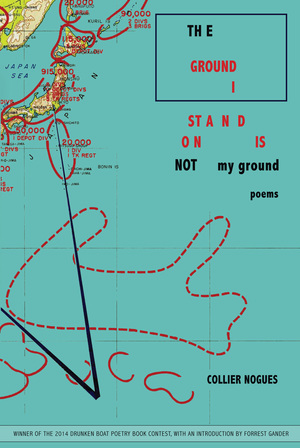 Nogues’ canny selection of erasure as vehicle to address these issues allows her to (un)layer irony, the universality of aggression, and power redistribution, via her selection of dazzlingly diverse source-texts, each (at least) tangentially related to Okinawa, so that the serial colonization of this region becomes a microcosm of the post-Pacific War occupation of Japan, which itself a single example in the commentary on aggression woven by Nogues’ re-contextualization of words and letters from those underlying documents. by the hand of a form the same as his. Nogues demonstrates breadth, delving also into the psychological effects of war, by repeatedly erasing in “Dear Grace” the same source text, a memo from Assistant Attorney General James Rowe, Jr. to President Roosevelt’s secretary in 1942 concerning the “Japanese situation in California.” Each successive erasure becomes an increasingly and alarmingly incoherent letter home from a serviceman, allowing the text to simultaneously condemn both what was done to certain citizens left behind at home (as the source-text) and those sent abroad to serve (as the erasure). Jessica Goodfellow is author of Mendeleev’s Mandala (Mayapple Press, forthcoming 2015), The Insomniac’s Weather Report (Isobar Press, 2014) and chapbook A Pilgrim’s Guide to Chaos in the Heartland (Concrete Wolf, 2006). Her poems have appeared in Best New Poets, Verse Daily, and The Writer’s Almanac. She is a past recipient of the Chad Walsh Prize from Beloit Poetry Journal. Possessor of a graduate degree from Caltech, she lives and works in Japan.